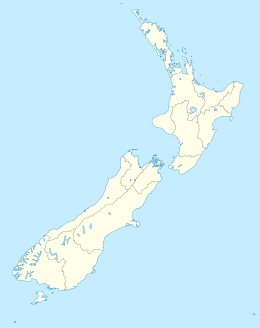 Motuarohia Island (Roberton Island) is a small island in the Bay of Islands of New Zealand, located about 4 kilometres (2.5 mi) northeast of Russell. The island stretches for 2 kilometres (1.2 mi) east-west, with the south coast offering two bays backed by sandy beaches. The north coast is dominated by steep cliffs in the west, rising to 78 metres (256 ft), and two shallow lagoons in the west. The twin lagoons nearly reach across the island to the bay on the south coast, almost bisecting the island. The majority of the island is in private ownership, however, 19.4 hectares (48 acres) of public conservation land in the central section of the island are managed by the Department of Conservation. Motuarohia Island has a long history of human settlement, as evidenced by archaeological sites including a pa site, terraces and pits. In 1769, Captain James Cook anchored the HMS Endeavour just south of the island, hence one of the bays is named Cook's Cove. His reports indicated that there were 200 to 300 Maori on the island and a pa at the eastern tip of the island. The island became also known as Roberton Island after the one-time owner who purchased it from Ngapuhi chiefs in 1839. Ownership of parts of the island changed hands later, and since 1979 the central section of the island, including the lagoons, is publicly accessible Department of Conservation land. As part of the Department of Conservation's "Project Island Song", Motuarohia is pest-free and home to a number of endangered bird species, such as whitehead, brown kiwi, and NZ dotterels during breeding season. Native forest is regenerating in most parts of the island, in particular in an area of felled pine at the western end. The twin lagoons in the central section of the island are surrounded by kikuyu grass flats. This area is used as a stopover point by small tour boats from Paihia and Russell, although not as popular as the much larger Urupukapuka Island nearby. At Motuarohia Island, the tour boats anchor in the bay and use a small tender to ferry passengers to the sandy beach. A walking track leads from this area to a lookout point overlooking the twin lagoons. There is also a walking track to the pa site, and an educational underwater trail for snorkellers. Wikimedia Commons has media related to Motuarohia Island. ^ "Motuarohia Island (Roberton Island), Northland – NZ Topo Map". NZ Topo Map. Land Information New Zealand. Retrieved 9 October 2018. ^ a b c "Motuarohia Island Recreation Reserve: Places to go in Northland". Department of Conservation. Retrieved 9 October 2018. ^ Bruce W. Hayward, A.E. Wright (1980). "Archaeological sites on small islands in the eastern Bay of Islands, Northland" (PDF). University of Auckland. p. 152. Retrieved 12 October 2018. ^ "Discover a 'beloved island': Motuarohia in the Bay of Islands". Tourism New Zealand. Retrieved 12 October 2018. ^ "Project Island Song – Wildlife sanctuary, Bay of Islands: Our work". Department of Conservation. Retrieved 9 October 2018. ^ "Motuarohia (Roberton) Island Track: Motuarohia/Roberton Island, Northland". Department of Conservation. Retrieved 9 October 2018.